Stream live video from your BlackBerry with Next2Friends | BlackBerry Blast! Here is a very interesting application that allows you to stream live video from your BlackBerry. 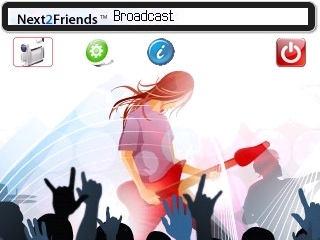 Next2Friends is an application that allows you to stream live video, or upload images to your blog from your BlackBerry. All you have to do is sign up for the service and download their application . Next2Friends works on OS 4.5 or later. There's no cost except data usage on your BB. Live: Real-time streaming from device to web. Snapup: Easily snap and upload a photo to the web in just two clicks. Snapup can also automatically send a copy to your email. Tag & Meet: Intelligently matches virtual profiles in the physical world. Proximity Tagging: Build a network of friends out of the people you pass everyday. Next2Friends Tag extends your profile into physical space by sensing (within 30 ft) and automatically suggests others with whom you have something in common. Ask: Snap a photo, type in a question and have it beamed and the answered by all your friends. BlackBerryNews has reviewed the application so check out the source link for their review.